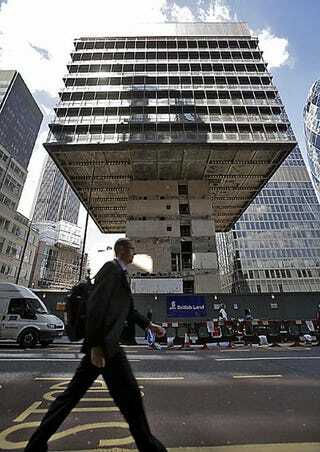 A 15-story office block in the heart of London is being demolished backwards in order to build a skyscraper in its place. Demolishers are working up from the ground level upwards, dismantling each floor to reveal the concrete core of the P&O building. Find out why, and the new skyscraper replacing it, after the jump. When the P&O building was constructed in 1965, each floor was hung from a huge beam at the top of the tower and supported by the central core. According to Matthew White, project director, the weight has to be removed from the structure from the bottom up. "Eventually the beam will be deconstructed at roof level, leaving the core, which will be demolished from the top down." And this is what will replace the '60s block—a 735-ft sliver of skinniness from Richard (now Lord) Rogers.